Hey everyone, my name is ENOJI Kengura, i am actually a Catholic fur. I just thought you'd guys like to know. Anyway, I would like to speak to you guys, you guys seem really nice, i was introduced to this site by my friend Groot Liska. And i admit, IRL, im not too religious. Yes, i do go to church on sundays, but things like prayer, the rosary, and other things, I don't do often. Before joining this site, I felt inferior to join because I felt like i would be looked down upon, but Groot has convinced me of otherwise. please message me, Ill be really glad to meet you guys. I am an aakor, which is a furry wolf with wings, which is actually in greek mythology. x3 I live in the hot state of texas. Well technically, it changes alot so its hot and cold alot. ANYWAY, I am a huge fan of Hardstyle which is a fast paced techno music. 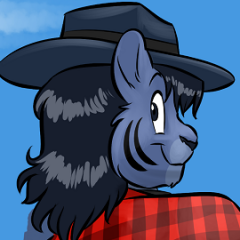 awesome fursona and welcome to the club! we have a few other catholic furs here too, so don't worry about it. Welcome ENOJI1! This place has been a wonderful place to make new Christian friends without being judged for our interest in furries and great source of Christian fellowship. One of the cool things about fellowship is that it can bring Christians closer to each other and, I believe, to Christ also. I think my friends will back me in saying, we're not here to judge each other. We are here to support each other and bring one another out of the darkness of our individual lives. None of us are perfect and we all have things we'd like to improve. I hope you will find fellowship here and just maybe your walk with God can grow from having more Christian friends as a result. Now that the big-mouthed tiger has rambled, why don't you tell us a bit more about yourself? Maybe you have some hobbies in common with some of us (aside from looking at furry pics on deviantart ;3). Welcome CF buddy. Its a real treat to have you join us. Please make yourself at home. Also like Thomas said this is a judgement free zone here. Also most important thing is we are here to share our stories, our trials, and our achievements as Christians. I honestly have to say you will like yourself here. The last week that I've been here has been a major blessing and I'm sure it could be for you. i started out like you a few years back. aim for the stars and keep on trying no matter what and you'll get to where you want to go, whether its with music, travelling to conventions, drawing, or anything else! ^^each is a goal for me! Hello and welcome =3 I'm glad you've joined. Wow is God really rewarding me?? GOD IS GREAT! He's rewarding me with Catholic furries and many Christian furry buddies to help me! Oh God! Thank you! I love God! He's my best buddy truly and no money could bring what I'm getting now! Also, you don't need to be much religious. Faith comes first, then religion. But growing in faith, you can only in the Church. It's not just the Catholic Church, but basically all of us Christians. But I have to admit that Catholics have lots of godly power in conversion and delivering God's word. Also, might you maybe be a cuddly furry? X3 Because I am! X3 And I see God in you, I'm gonna cuddle the giggles out of you! welcome to the site. I hope you can find fun and fellowship here. It is not hard to find, and there are so many conversations to jump into. Debates, struggles, prayers, roleplay and some of the best weirdos you can find. The site itself has a irc chat, there is also furrychat.com, and some group chats on skype. x3 well that sounds cool! x3 aww, cute! and thanks! x3 well thank you, she is quite the artist! Welcome, Enoji! ã¯ã˜ã‚ã¾ã—ã¦ï¼Nice to meet you. Welcome to Christian Furs! I'm Joshua Reynard, one of the local foxes. Nice to meet you, Enoji! I'm trying to get into music production myself, but life keeps getting in the way... I'll eventually get something finished, I hope. What is up! i take a small break and lots of newcomers out of nowhere.